Beaverton Library Foundation is proud to be a partner with the New Friends of Beaverton City Library. 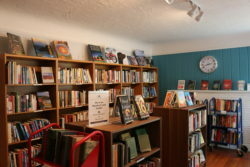 NFBCL sells used books, videos, and music at their store, The Book Corner and online. They spent the winter remodeling the store and reopened with a fresh new look in April. Stop by and take a look! Congratulations to NFBCL on their grand re-opening!